With their eighth-round pick, the Red Sox have selected outfielder Forrestt Allday from Central Arkansas. Allday is a senior center fielder listed at 5-foot-11, 185 pounds. 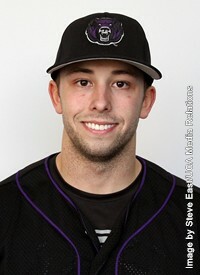 He was named to the 2012 All-Southland Conference Second Team. That same year, he also led SLC and ranked third nationally in walks with 1.04 walks per game, setting a school record in the process; and led SLC and ranked 14th nationally with an on-base percentage of .486, good for ninth in school history, according to the school's website. He also managed seven outfield assists in 2012. In 2013, he played in 64 games and led his team in batting and on-base percentage, at .365 and .503, respectively. He also tied for second on his team with three home runs, while stealing 15 bases in 18 attempts. It looks likely that the Red Sox will try to sign him for under the slot recommendation in order to spread that money to other tough signs.